Alfred University offers a Certificate in Advanced Study in School Counseling. The program is designed to give Licensed Mental Health Counselors New York State Certification as a School Counselor. 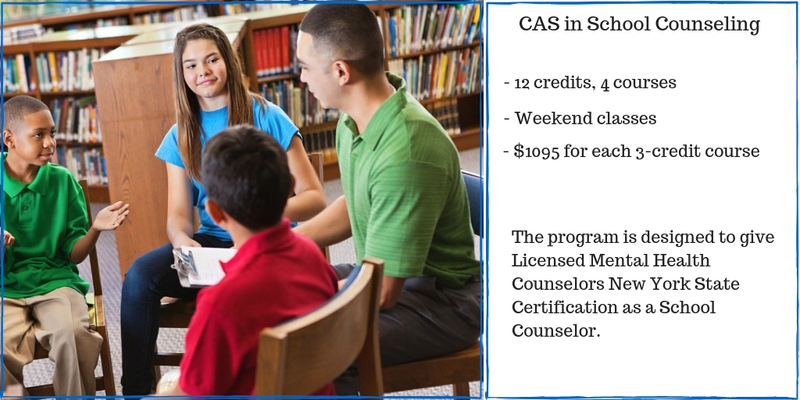 Individuals who successfully complete this State Education Department approved program will meet the requirements for Certification as a School Counseling in New York State. CITE is a proud partner, helping extend Alfred’s reach. We aid in delivering Alfred’s innovative Master’s Programs in Mental Health Counseling, School Counseling, Public Administration, a Certificate of Advanced Study in MHC, a Certificate of Advanced Study in School Counseling, and now Undergraduate Completion to students in and around NYC.